by Absolute Value of Noise © 2016. 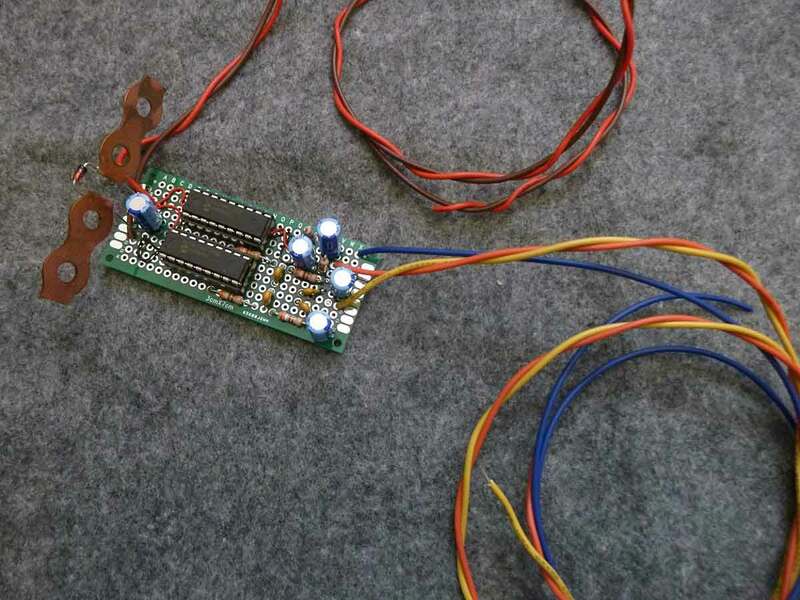 Bio-electric Radio is an outdoor sound installation. The piece imagines a world where electronics and living plants have merged and hybridized into "living circuits." 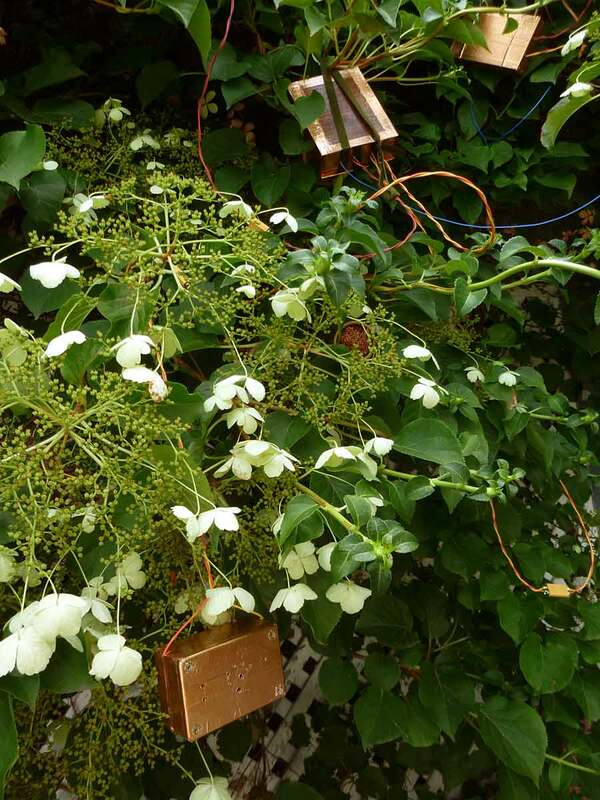 These circuits make sounds and broadcast them to the world using long antennas made of vines. The sound is made up of recordings of individual bees (honey bees, bumble bees, miners, leaf-cutters, and unidentified varieties) mixed with tones and sound artifacts from bio-electric synthesizer modules (modules that use parts of the plant within their circuitry). The virtual bees inhabit the radio-waves like ghosts that sing along with the sounds of the plants themselves. The piece is solar powered and goes through different phases and moods depending on the weather and the time of day. This is a mix of sounds recorded when the installation was in Halle (Saale). There are five pieces, each made at a different time of day and from different parts of the machine. 1. Windowsill [0:00 to 4:02] .. late night to early sunrise while the bio-electric circuits sleep and then start to wake .. 2. Transmitter [3:40 to 16:14] .. the piece is fully alive with virtual bees .. 3. Untuned [15:39 to 25:37] .. sounds found while tuning the circuits .. 4. Rustle [25:20 to 27:10] .. wind moving through the leaves of the plant where the piece was installed .. 5. Plant Duo [26:05 to 41:42] .. a duet performed by two bio-electric synthesizers .. recorded by happenstance at a random time in the afternoon when the sun was just breaking through the clouds. Bio-electric Radio at Radio Revolten, Halle (Saale), October 2016. Photo by Sally McIntyre. Bio-electric Radio at Radio Revolten, Halle (Saale), October 2016. 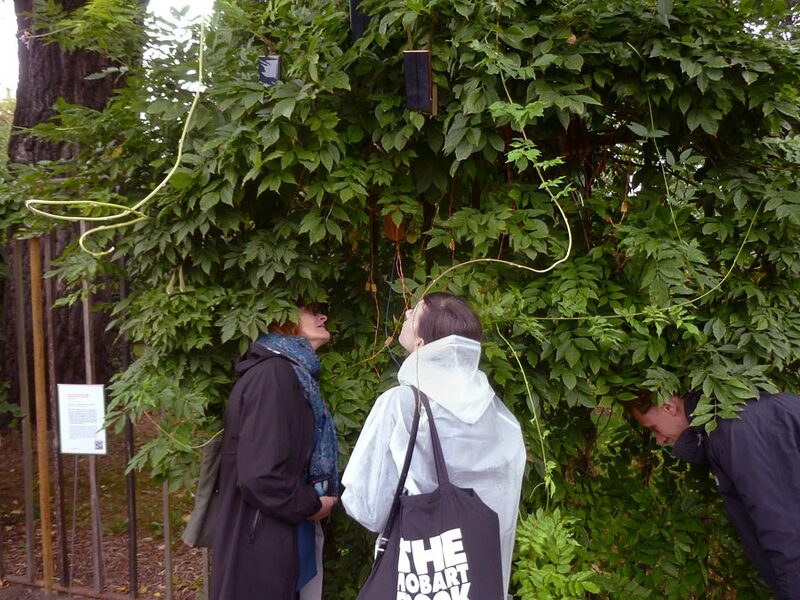 – For Radio Revolten (a festival of radio art, October 1 - 30, 2016) Bio-electric radio was installed in a Wysteria at the Botanical Garden in Halle (Saale), Germany. Here the piece was able to react to the passage of the sun and the movements of the clouds. – For Kunstradio on the ORF, May 22, 2016, I recorded various sounds from the piece hanging in my studio window. I collected the sounds of sunrise and sunset, the moment when the bees woke up, the racket of the daytime (when all the solar powered devices are running with full energy), and a duo of plant-synths (interconnected with the electro-chemistry of some branches I'd collected from outside). From this material I composed six pieces for the radio - sunrise, wakeup, transmitter, plant synth duo, receiver, and sunset. 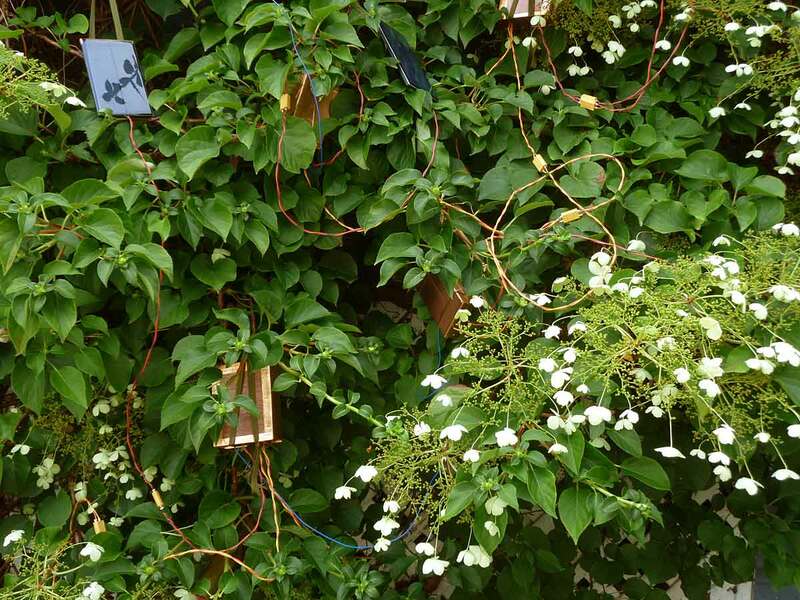 – For Art's Birthday, January 17, 2016, the piece was broadcast through the branches of the climbing hydrangea in front of my house. 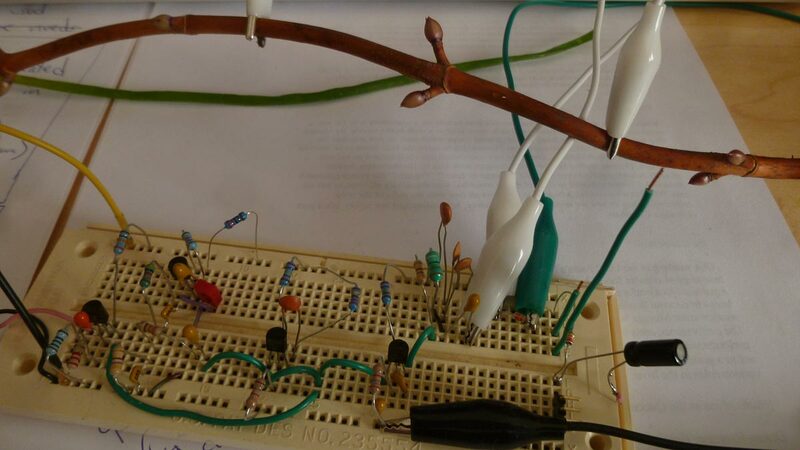 A receiver, wired into the same plant using bio-electronic circuitry, collected the sounds and streamed them to the net on NoiseartRadio. 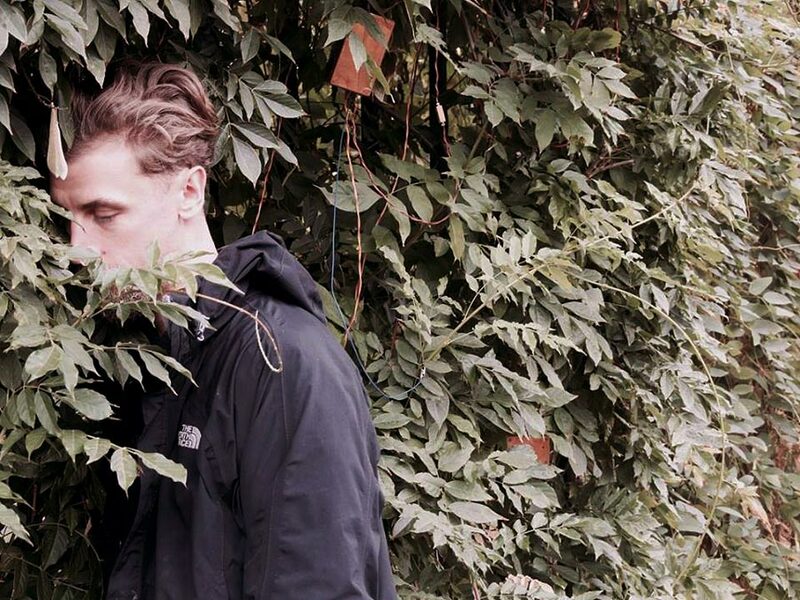 The piece explores ideas and research around the electro-chemical relationship between bees and plants. It delves into the "bioelectric" theories of Georges Lakhovsky (1869-1942), and it develops my own interests in radio, electronics, and bringing attention to phenomena that are typically invisible, or overlooked, within our environment. 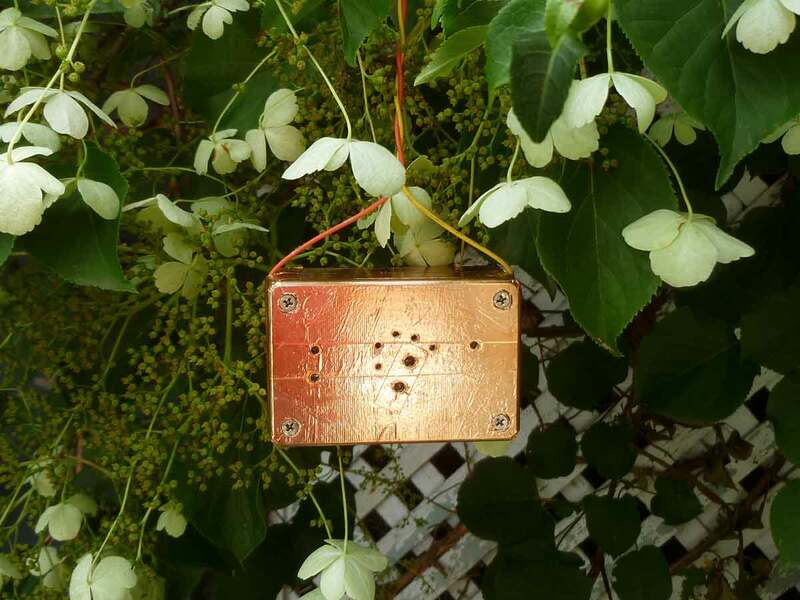 The piece is solar-powered and consists of several modules - sound players for the bee recordings, bio-electric synthesizers, vine-transmitters, vine-receivers, and small AM-radio type speakers. All of these modules hang in a climbing plant. They interconnect with each other as well as running signals through the shoots and branches of the plant. Bio-electric Radio - Speaker, July 2016. Bio-electric Radio - Speaker + Receiver, July 2016. Bio-electric Radio - bio-electric synths hidding in the greenery, July 2016. 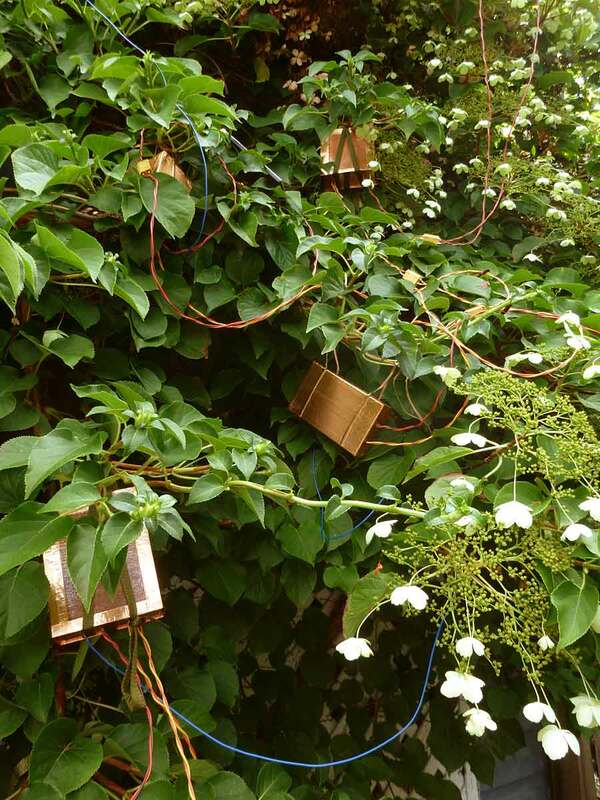 Bio-electric Radio - installed in the climbing hydrangea infront of my house, July 2016. Bio-electric Radio - Transmitter, March 2016. 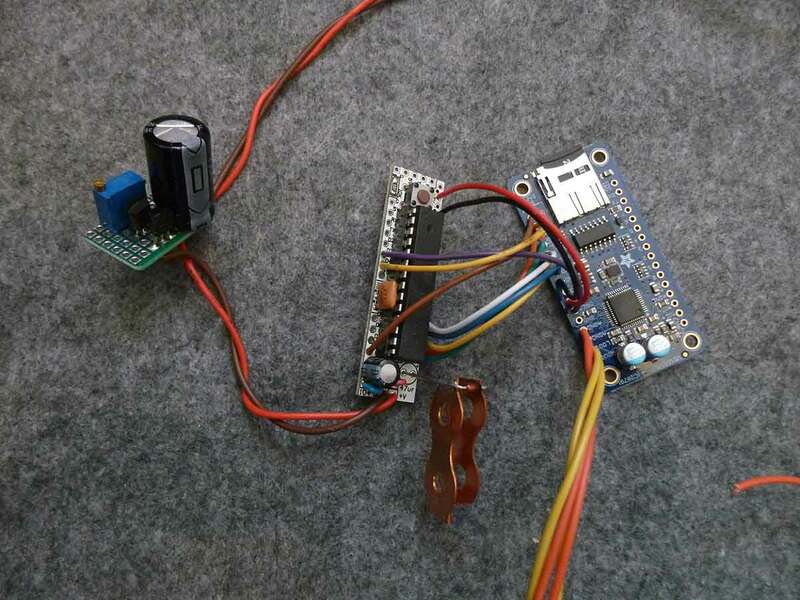 Bio-electric Radio - Receiver, March 2016. 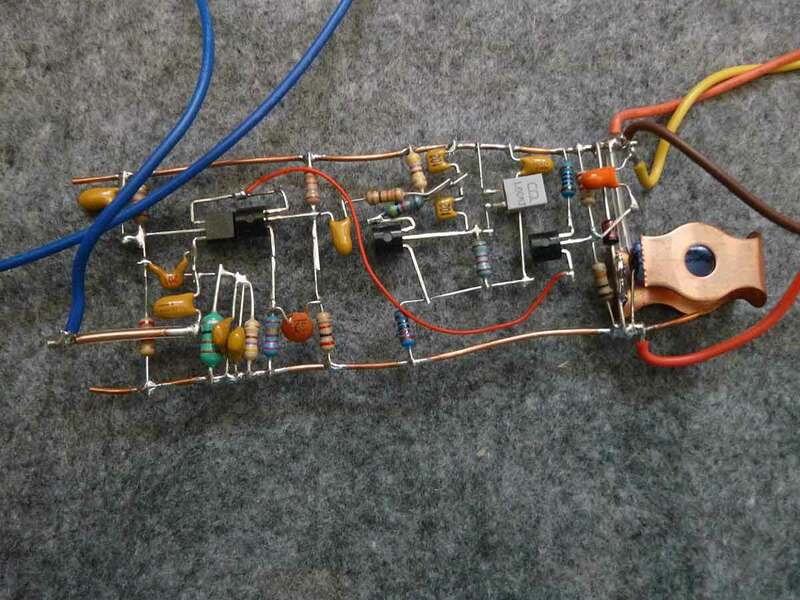 Bio-electric Radio - Plant Synth, March 2016. Bio-electric Radio - Bee sound player, March 2016. 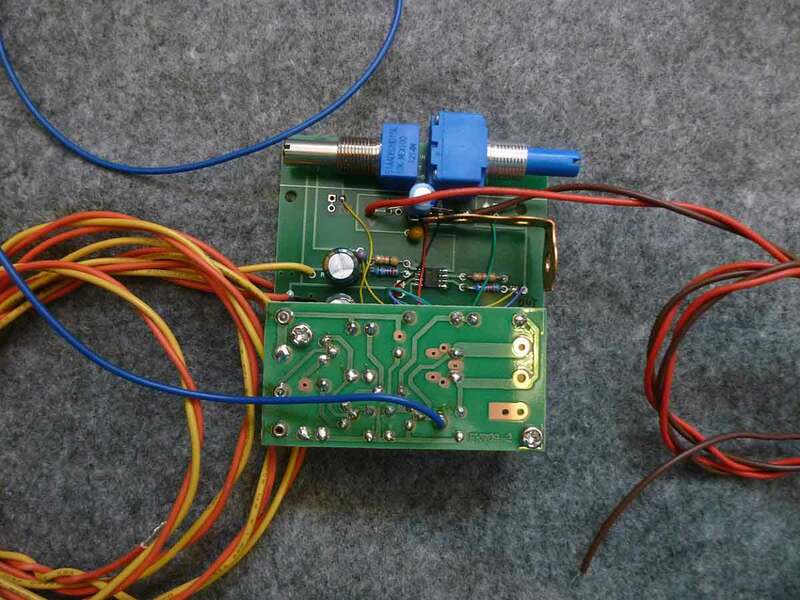 Bio-electric Radio - prototype transmitter, December 2015.